Freedom Golf Association is helping kids learn how to play the game, but is also teaching them important life lessons. NBC 5's Mike Berman reports. It still may not feel like it’s golf weather outside, but at Lyons Township High School, a group of students are still learning how to play the game through an innovative new program. 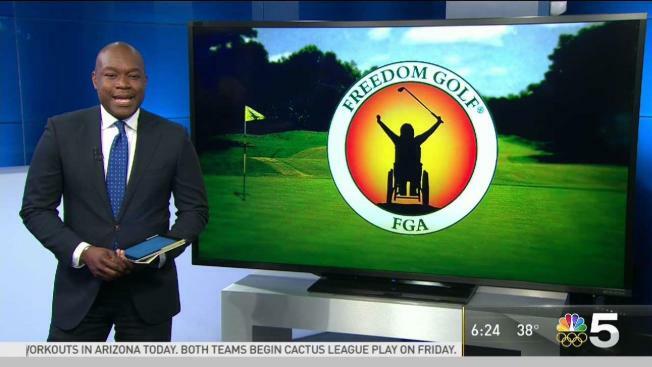 That program, called the “Freedom Golf Association,” was started by E.Q. Sylvester in 2012, and it aims to give people with disabilities the chance to learn how to play golf. “These kids, no matter their disability – autism, Down syndrome, amputee – they’re all out there playing, and they’re all having fun,” Sylvester said. The program utilizes special golf clubs that allow players to have a unique hands on experience. Lighter than traditional clubs, they also feature a big face and have colorful grip markings to allow students to make good contact with the ball, putting a big smile on their faces in the process. The program has also been introduced at 14 other area high schools, with more expected to pick it up in the coming years, and the benefits go far beyond the golf course. As for the students themselves, the program also has them dreaming big about what the future can hold. “It’s very fun and I want to play golf on the PGA Tour,” student Roy Massey said.